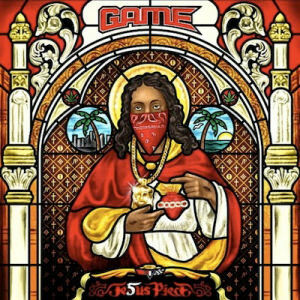 RapReviews.com Feature for December 11, 2012 - The Game's "Jesus Piece"
At this stage, save for a remarkable turnaround, The Game's five album run in less than eight years on Interscope Records will be both remembered and forgotten for clearly defined reasons. His technical rapping ability has steadily improved (which is actually quite a rare and welcome trait); his name-dropping has been so incessant that you can help but give him a bye for it now; plus he's dropped two classics, and two albums that have already been largely forgotten. His is a story of surviving gunshots, hustling that mixtape game, then getting a deal that now probably seems more like an anchor than anything and constant beef. However, to give credit where it is due, he damn well knows how to put an album together: only "L.A.X." didn't flow too well, whilst every other joint - whether well-received or not - is always put together expertly. "Jesus Piece" almost manages continue that fine run, even it is a shamelessly half-hearted attempt at a concept album, whilst also piling in as many guests as he possibly can (I counted at least 24 guest features). The fact that it seems to be getting a lot of praise as one of the albums of the year says a lot more about how disappointing 2012 has been, as opposed to how great "Jesus Piece" might actually be. The name-dropping is here and present, in full effect - it's just that now, Taylor also name-drops God a lot (the religious angle is more of a parachuted-in theme). There is also a catchy single featuring Lil Wayne, Tyga, Wiz Khalifa and Chris Brown that's generated interest. Yet, one can't help feeling that The Game is keen to end his uneasy alliance with Interscope Records, and it seems like JP is a hastily-assembled end of year dorm party where the students rebelliously spray shaving foam and talk all night about how they are gonna rule the world. Consistency isn't a problem on "Jesus Piece" - whether we are talking about the rapper or the music. The Game should catch a few people by surprise here, as he delivers some genuinely impressive wordplay and some brilliant punchlines ("Heavens Arms" is the only song with no guests, and he goes pretty damn hard throughout). His usual idiosyncrasies are back with a vengeance, but you should know all about his quirks by now. Musically, pretty much every track is consistently solid - but there are very few spectacular highlights, with pretty much nothing threatening "classic" territory (except maybe "Pray" and "All That (Lady)" at a stretch). It's all particularly derivative of whatever Game's been listening to on his iPod Shuffle - one would assume a lot of "Cruel Summer," Rick Ross and Bone Thugs. It's a shame, as the lead artist doesn't seem to be able to connect fully with his audience any more, and it is a far cry from him "Doctor's Advocate" days. But some people just want an album full of decent beats, a solid rapper and some hummable choruses. Songs like "Jesus Piece" really don't fire on all cylinders (Kanye's feature is a return for Game's one-line chorus on "Crack Music" and Common's verse is clunky). 2 Chainz and Rick Ross do as expected on "Ali Bomaye" whilst Pusha T apes his own "New God Flow" on "Name Me King." Last year, Kendrick set "The City" ablaze on the R.E.D album opener, but "See No Evil" just doesn't quite compare. The last couple of tracks before "Celebration" are practically phoned in ("Hallelujah" and "Freedom"), such is the eagerness to get to the finish line. And yet there are a few songs that are worth your time. "Pray" featuring J.Cole is quite excellent, with the beat, subject matter and delivery from both artists - who are basically the same (have you noticed how similar Cole is to Taylor?) - making it a pleasant surprise that ties into the theme, as well as being a standalone track worthy of praise. "Celebration" functions well as an early-90's BTNH throwback, whilst "All That (Lady)" flips a D'Angelo sample to good effect. "Heaven's Arms" finds Taylor on fire, whilst "Can't Get Right" displays his confessional side pretty well. And the album opener bangs hard, with Meek Mill earning his appearance fee. To be honest, this just doesn't really feel like a Game album - there's a distinct lack of drama, of real hyperbole, of genuine excitement. It tends to come across as a resume, showing him off in the shop window for potential labels to sign him up (my bet is he ends up with MMG or someone on a short deal). The album covers (whether the genial stained glass black Jesus or the beautiful simplicity of his late brother, shot in the prime of life) deserved more, and it fails to deliver on the promise hinted at by the artwork. Whilst this review may come across as overcritical, it's just that this doesn't feel genuine, and it seems like Game's already moved on to the next phase of his life. He's been called a jack of all trades, but he does have some exceptional talents that he's probably just saving for his next deal - when he will have to prove himself all over again.